John Waters has always been interested in shocking people with his films. But as he writes in his aptly titled memoir 'Shock Value', there's good bad taste, and bad bad taste. It's not enough just to be offensive. Waters believes, to quote his book, that, "good bad taste can be creatively nauseating but must, at the same time, appeal to the especially twisted sense of humor, which is anything but universal." 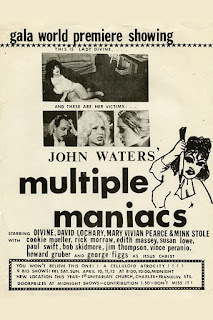 That pretty well sums up MULTIPLE MANIACS, the black and white feature length atrocity that preceded his infamous, career making breakthrough PINK FLAMINGOS. In MANIACS, bored suburbanites are lured in to a twisted circus of sorts called "The Cavalcade of Perversion." Mr. David (David Lochary) serves as master of ceremonies, introducing such performers as, "the puke eater. He'll lap it right up for you, he loves it," also promising, "you'll see two actual queers kissing each other on the lips. These are actual queers!" And the price is right: free! What bored bourgeoisie could resist? The star attractions is Mr. David's girlfriend, Lady Divine (Divine aka Glenn Harris Milstead). As it turns out, she doesn't really have an act. Instead, she pulls a gun on the audience and demands they turn over their cash and valuables. But Lady Divine has been growing increasingly unstable, and winds up shooting one member of the audience who dares to insult her. From there, things only get more surreal, offensive, and (if you have that especially twisted sense of humor Mr. Waters wrote of) more hilarious, as well. Director/writer/producer/cameraman/editor Waters was pretty green here, but still managed to turn in a fairly well shot and edited film. It has been digitally restored for this release, and actually does benefit from the makeover. There are still a multitude of rough edges, but the image now has a sheen and clarity to it one would never have thought possible. Waters's cast of regulars, the "Dreamlanders", are pretty green, too. Some flubbed lines are still in the final cut, but the enthusiasm and fearlessness of these (then young) performers more than makes up for it. Aside from the aforementioned Divine and David Lochary, Edith Massey, Mink Stole, Mary Vivian Pierce, Cookie Mueller, and Paul Swift all have memorable roles. It's not quite on the level of PINK FLAMINGOS, either in the sense of the filmmaking technique, or in the degree of outrage and laughs in produces. 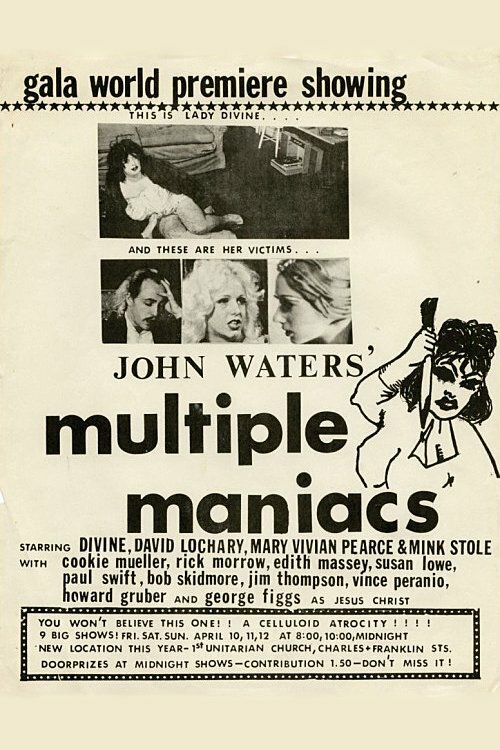 But MULTIPLE MANIACS is nonetheless a highly entertaining film for those who share Waters's sensibilities, and one that still possesses the power to shock and appall for those who don't. Here's hoping the rest of Waters's early films get a similar restoration and re-release. 3 out of 4 stars.